Golden Dawn Minerals (GOM) had previously optioned the Tam O’Shanter but the option was allowed to lapse due to poor market conditions. The Tam O’Shanter property is part of the overall land package included in the acquisition of Kettle River Resources Ltd. Thus, GOM again holds a 100% interest in the property. 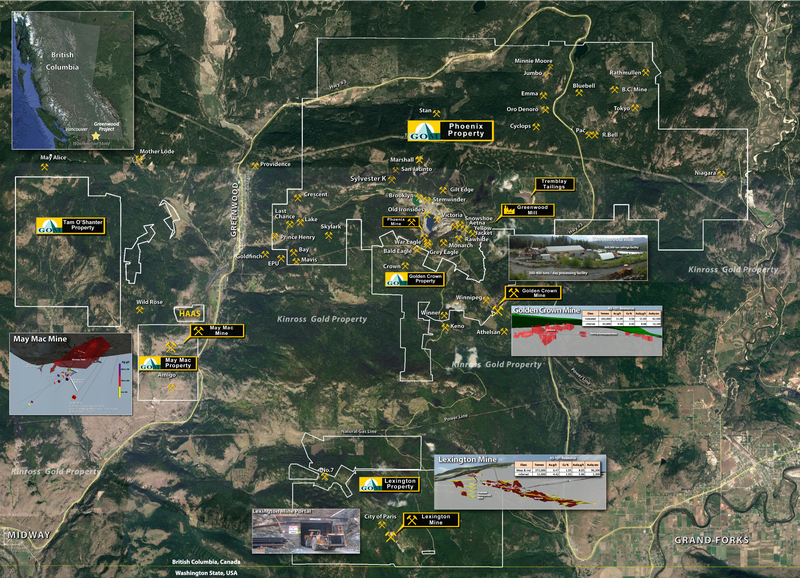 Drilling by GOM during 2010 and 2011 along with historic drilling on the Tam O’Shanter and adjoining Wild Rose properties was used in the estimation of an Inferred Mineral Resource for the “Deadwood-Wild Rose Area”. At total of 24,483,000 tonnes at an average grade of 0.53 g/t Au using a cutoff grade of 0.3 g/t Au was estimated on the two properties (based on using a cutoff grade of 0.3 g/t Au). This is documented in a Technical Report by Dufresne and Nichols (2013). Based upon the drilling conducted to date, the Deadwood – Wild Rose deposit remains open in both directions along strike and at depth. In the January 25, 2013 Updated Resources Technical Report for the Tam O’Shanter and Wild Rose property the authors recommended further drilling to test for possible extensions of the resource as well as possible higher grade zones. In addition it was noted that first pass drill testing of a number of Au-Cu soil anomalies had identified significant mineralized intersections. These anomalies along with a number of other untested anomalies warrant further drill testing. 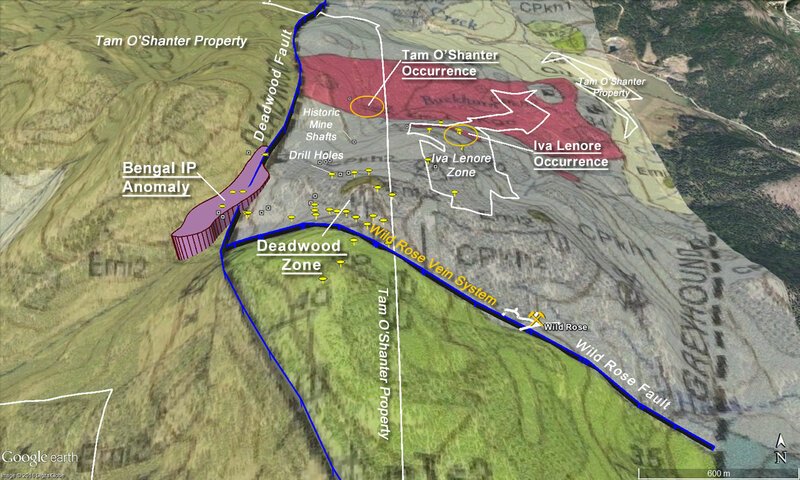 Although the Deadwood deposit straddles the Tam O’Shanter-Wild Rose boundary (GOM only ownes the Tam O’Shanter property) GOM plans to further test the westerly extension of the Deadwood deposit along with other mineralized zones and anomalies on the property. Three or more sub-parallel quartz veins, located in a wide zone of intense shearing and silicification, occur along the Wild Rose Fault and are collectively known as the Deadwood Gold Zone. 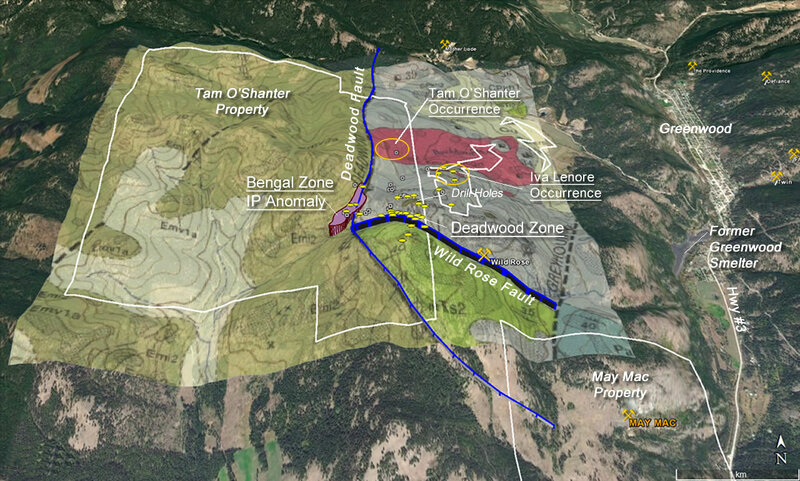 The Wild Rose vein is located within the Deadwood Gold Zone on the Tam O’Shanter Property where it is considered as the main vein. The Wild Rose vein, which occurs within the main Wild Rose fault zone, is a gold-bearing quartz vein approximately 1-4 metres wide, striking approximately 125º and dipping at 65-70º to the north. Initially, the vein was discovered through drilling because it does not outcrop on the surface. Overall, 19 drill holes have been drilled to test the Wild Rose vein (on the Tam O’Shanter Property). The drilling was done over a strike length of about 700 metres and to a depth of 210 metres. North of the area that was drilled, a shaft and an adit (the Golden Fleece workings) expose an area of bleached, altered quartz diorite, cut by a stockwork of quartz veinlets. A 0.5 metre vein, mineralized with pyrite, chalcopyrite and molybdenite, is exposed in this area which may be the surface expression of an (upper?) hanging wall vein.